Democrats have an economic duty—and a political opportunity—to counter the House Budget with a robust growth agenda, which Americans favor across the spectrum. When it comes to budgets, debts and deficits and, most importantly, the future of the US economy, there are two distinct visions competing in Washington. Both cost a lot of money. But they seek to steer the United States in radically different directions. One vision, that of House Budget Committee chairman Paul Ryan, spends our federal largesse on tax breaks for the rich and schemes to divert Medicare funds into the accounts of private insurers. It’s classic crony capitalism. But that’s not the worst of it. Because Ryan’s plan comes wrapped in an austerity model for squeezing government spending and investment, it threatens to stall an economy that is only beginning to grow at a rate sufficient to create needed jobs. On Thursday, the House voted 221-207 for the Ryan budget. The Republican majority was reasonably solidified in support of the proposal, although ten sincere fiscal conservatives opposed a measure that focuses far more of satisfying the demands of Wall Street donors than actual deficit reduction. Democrats overwhelmingly opposed the Ryan budget. That can and should be read as a rejection of the ugliest face of austerity. But it is not the case that congressional Democrats are united when it comes to presenting an alternative to Ryanism. And that’s a problem because voters don’t just want Congress to reject austerity; polling data makes it clear that they want an alternative that is focused on job creation. The best alternatives to the Ryan budget have been presented by the Congressional Black Caucus and the Congressional Progressive Caucus. The two groups, which have a significant overlap in their membership, saw their proposals rejected by the House on Wednesday. Ryan’s Republican colleagues opposed both plans, as did dozens of cautious Democrats who have yet to recognize the importance of challenging the lie of austerity with a no-holds-barred growth agenda. It will be in the wrangling between the House and Senate, and the broader national debate, that the fiscal and economic priorities of the nation will finally be shaped. And it is important to recognize that, in that broader national debate, Ryan and the House majority have already lost. The American people have no taste for austerity. Those positions are antithetical to everything Ryan is proposing. That’s a growth agenda that is the opposite of austerity. It is a growth agenda that mirrors what the Congressional Progressive Caucus has proposed with its “Back to Work” budget. The CPC budget plan balances the budget far more efficiently and effectively than does Ryan’s—as it eschews the pay-to-play giveaways to campaign donors in the insurance, pharmaceutical and financial-services industries—and stimulates job creation. That’s because the CPC proposal rejects austerity in favor of growth. The focus on growth is essential to the CPC plan, which is wholly distinct from other Democratic plans that seek to strike an often incoherent balance between smart investments and Ryan’s austerity. Actually, as the Gallup survey confirms, Americans have made their choice. Unfortunately, the House majority remains, as the recent Republican National Committee “autopsy report” on why the GOP fared so badly in 2012 notes, badly “out of touch” with the great mass of Americans. On Wednesday, 84 House members, all of them Democrats, backed the “Back to Work” budget. Opposing it were 225 Republicans and 102 compromise-prone Democrats. The vote came on a day when the chamber also rejected the commendable Congressional Black Caucus budget by a similarly wide margin and the less-inspired Senate Democratic budget plan on a narrower split. The good news is that this week’s House votes represent political theater, rather than political reality. The real fights lay ahead. And Democrats would be wise to recognize this fact. Despite the absolute certainty that his plan will not be adopted, the House Budget Committee chairman will keep promoting his austerity agenda, with its crony capitalist payouts to political benefactors. And a number of Republicans in the House and Senate will continue to suggest that it is the only way. 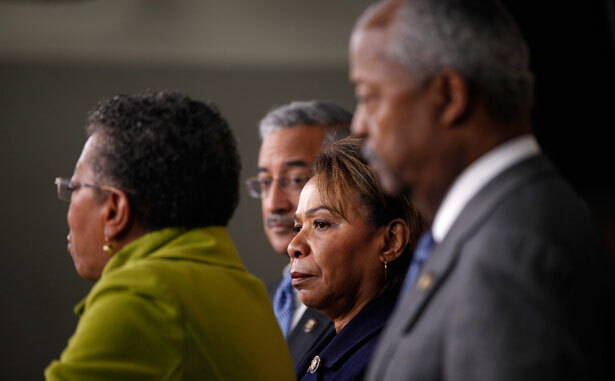 Neither the “pro-growth, pro-people, pro-America” Congressional Black Caucus budget—with its smart focus on investments to save the jobs of teachers and first responders—nor the Congressional Progressive Caucus “Back to Work” budget will, unfortunately, be adopted in its entirety. But these plans outline agendas that are dramatically sounder—and that have dramatically more popular appeal—than the proposal Ryan will continue to advance. As such, the ideals and the sound fiscal and programmatic approaches outlined by the CBC and the CPC ought not be abandoned by progressives simply because the better plans did not win an endorsement from the Republican-controlled House. The final budget that comes out of Congress will be a compromise. There’s no doubt about that. But congressional Democrats should not come at the process from a place of compromise. House Republicans will go to their corner, backing the austerity agenda outlined in the Ryan budget. Senate and House Democrats will have many opportunities in coming weeks and months to propose clear alternatives. They will regularly revisit budget issues in debates about various plans, in conference committee negotiations, in new votes. The place of beginning for the Democrats—and, frankly, for responsible Republicans—ought to be with an absolute rejection of austerity and an embrace of growth based on investment in job creation. The American people want a “Back to Work” budget. The polling is clear and unequivocal in this regard. Gallup found that 92 percent of Democrats back federal spending to create infrastructure jobs, but so, too, do 71 percent of independents and 53 percent of Republicans. Federal spending to create one million new jobs has the support of 93 percent of Democrats, 63 percent of Republicans and 52 percent of Republicans. But polling data does not provide the only confirmation of where the American people are at. There’s a signal to be read, as well, from the 2012 election results that gave President Obama and Vice President Joe Biden a 51-47 win over Mitt Romney and Paul Ryan, along with a popular victory of almost 5 million votes; that gave Democrats fifty-five Senate seats; and that, despite redistricting, saw 1.4 million more Americans vote Democratic than Republican in competitive House races. That’s a message Democrats need to take to heart if they are going to get in touch with the American people and provide the needed alternative to the crude mix of crony capitalism and austerity that Paul Ryan is peddling.